M&T Bank Stadium is a multi-purpose football stadium located in Baltimore, Maryland. It is the home of the Baltimore Ravens of the National Football League. The stadium is immediately adjacent to Oriole Park at Camden Yards, the home of the Baltimore Orioles. Often referred to as "Ravens Stadium", M&T Bank Stadium officially opened in 1998, and is currently one of the most praised stadiums in the NFL for fan amenities, ease of access, concessions and other facilities. The stadium was originally known as Ravens Stadium at Camden Yards, until PSINet acquired the naming rights in 1999, naming it PSINet Stadium. It then reverted to Ravens Stadium in 2002 when PSINet filed for bankruptcy. Served by the Hamburg Street station of the Baltimore Light Rail, the stadium originally featured a natural grass surface. However, an artificial surface, Sportexe Momentum Turf, was installed for the 2003 season, which in turn was replaced by a new-generation Sportexe Momentum 51 in 2010. On December 4, 2015 the Ravens announced that in 2016 the team will go back to natural grass playing surface at M&T Bank Stadium, in which it had not been used since 2002. Lloyd Civil & Sports Engineering provided engineering design and construction oversight in both the 2003 and 2016 field conversions. The listed capacity for M&T Bank Stadium is 71,008. The stadium site was previously the site of the Wm. Knabe & Co. piano factory, which closed during The Great Depression. A sidewalk keyboard mosaic on the southwest corner of the stadium honors the company's legacy. In 2003, M&T Bank acquired naming rights to the stadium. The bank had recently entered the Baltimore market with its purchase of Allfirst Bank. Two other companies were in the running to be granted naming rights to the stadium; they were reportedly Nextel and CarMax. Following the September 2002 death of Baltimore Colts quarterback Johnny Unitas, public sentiment leaned toward renaming the then-sponsorless stadium after the Baltimore icon. However, the Ravens and the Maryland Stadium Authority held firm in their right to negotiate naming rights fees. In the end, the plaza in front of the main entrance to the Ravens' stadium was named "Unitas Plaza", complete with a bronze statue of the Hall of Famer. The plaza formerly featured large banners, each containing a picture of Unitas in his playing days, flanking the stadium entrance. After 10 years, these were replaced by large metal 19s (Unitas's number) for the 2012 season. In 2014, the Ravens unveiled a new statue of long-time Raven Ray Lewis next to Unitas' statue. The bronze figure depicts Lewis in the final pose of his iconic "squirrel dance", which he would perform before every Ravens home game upon coming on to the field. The stadium contains five levels, being the lower bowl, club level, 300 suites level, 400 suites level and the upper bowl. The lower bowl contains 42 rows of seats, split into two sections. The seats below the tunnel entrances are labeled from 1 to 18, while the seats above the tunnels are labeled from 19 to 42, except in sections 123-130, which contain rows 19-35, due to the press box taking up sideline space. On the club level, the rows are labeled from 1 to 13 on the sidelines, and 1 to 17 in the corners where no suites are located. In the upper bowl, the sideline seats are labeled from 1 to 32, while in the upper bowl end zones, the rows range from 1 to 26. Seat widths for the lower and upper bowls of the stadium vary from 19 to 21 inches, due to the curve design of the stadium, while the padded club seats range from 21 to 23 inches respectively. North-end view during Ravens Super Bowl XLVII run in 2013. The stadium is lighted in purple LED every Ravens postseason. The Ravens are the stadium's primary tenants. On December 7, 2008, an M&T Bank Stadium then record crowd of 71,438 watched the Baltimore Ravens defeat the Washington Redskins 24-10 on Sunday Night Football, only to be surpassed the next week when the Pittsburgh Steelers defeated the Ravens 13-9 in front of 71,502. 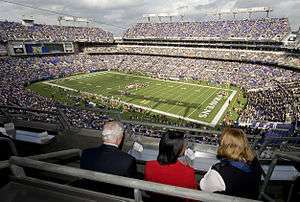 On January 15, 2012, a record crowd of 71,547, the largest in Ravens history, was in attendance at the 2011 Divisional Playoff Game in Baltimore against the Houston Texans, which the Ravens won 20-13. In 2005, the stadium was the site of the first rematch in the Maryland–Navy series known as the "Crab Bowl Classic" in 40 years. The two teams played again at M&T Bank Stadium on September 6, 2010 and Maryland won 17-14 . From time to time the stadium hosts college football matches for Navy. In 2007 the stadium held the Army–Navy Game for the second time, and in 2014 and 2016 it will host the annual Army–Navy Game. On October 28, 2006, the stadium held a contest between Notre Dame and Navy in which Notre Dame won 38-14. In 2014 the stadium played host to Ohio State–Navy, Ohio State won 34-17. In 2013 the annual rivalry between Maryland and West Virginia was held at the stadium. On October 24, 2015, the stadium hosted a Big Ten match-up between Maryland and Penn State in which Maryland lost 31-30. The Maryland Public Secondary Schools Athletic Association (MPSSAA) holds the four state football championships for Maryland's public high schools at M&T Bank Stadium. Two Baltimore high school football rivalry games have been held at the stadium in November. Baltimore City College plays Baltimore Polytechnic Institute every November, in one of the oldest high school football rivalries in the United States. Every Thanksgiving, Loyola Blakefield and Calvert Hall College also square off in what has now been called for many years as the Turkey Bowl, usually reaching up to 13,000 people in the audience. Both games were once played back-to-back on Thanksgiving Day at Memorial Stadium. However, when City College and Polytechnic joined the MPSSAA before 1994 season, the game was forced to be played in early November, due to MPSSAA rules and playoff schedule. On July 24, 2009, English Premier League club Chelsea F.C. won 2-1 against Italian Serie A team A.C. Milan in the first World Football Challenge at M&T Bank Stadium in front of a crowd of 71,203. On July 28, 2012 the stadium hosted a match between Premier League teams Liverpool and Tottenham Hotspur before 42,723 fans. The stadium was a venue for the 2013 CONCACAF Gold Cup, drawing a crowd of 70,450 to watch a quarter finals doubleheader between the United States v. El Salvador, and Honduras v. Costa Rica. The 2015 CONCACAF Gold Cup had two quarterfinals games at the stadium: United States v. Cuba and Haiti v. Jamaica, played in front of 37,994 spectators. The stadium serves as an alternate venue for the Johns Hopkins University men's lacrosse team, and was the site of the semifinals and final of the NCAA Division I Men's Lacrosse Championship in 2003, 2004, 2007, 2010, 2011, and 2014. Major League Lacrosse's Baltimore Bayhawks used the stadium as their home during the 2002 season. Popular music festival HFStival appeared at the stadium in 1999 & 2005, as Foo Fighters, Red Hot Chili Peppers, Silverchair, The Mighty Mighty Bosstones, The Offspring, Blink-182, Goo Goo Dolls, Billy Idol, and Coldplay have all played the concert. On July 4, 2000, Metallica played to a sold out crowd. U2 played at the stadium on June 22, 2011 on their U2 360° Tour to a record breaking crowd of over 75,000. Monster Jam was held at the stadium for the first time in 2011, and the stadium has been announced to become a normal stop on the summer tour. Monster Jam returned for the third time on June 8, 2013. On August 8, 2013, Jay-Z and Justin Timberlake stopped in Baltimore and performed in the stadium during their Legends of the Summer Tour. On July 7, 2014, Beyoncé and Jay-Z performed in the stadium during their co-headlining On the Run Tour. On July 25, 2015, Billy Joel returned to Baltimore after nearly 40 years and played at M&T Bank Stadium. On August 8, 2015, One Direction performed in the stadium during their sold out On the Road Again Tour. On June 10, 2016, Beyoncé performed at the M&T Bank Stadium as part of her Formation World Tour. The stadium served as the home field for the fictional Washington Sentinels in the 2000 film The Replacements with Keanu Reeves and Gene Hackman (though it was called Nextel Stadium). The stadium was also supposed to be the location of the football game in the 2002 film The Sum of All Fears and included footage of the presidential motorcade going to the building. However, the stadium used for the aerial shots is the domed Olympic Stadium in Montreal, while the book used Denver as the locale for the attack. ↑ "Vikings Notes". Star Tribune. October 24, 2000. Retrieved September 26, 2011. ↑ "Quarterback Injuries Rule the Day". Los Angeles Times. September 7, 1998. Retrieved September 26, 2011. ↑ "Ghosts at a Groundbreaking? ; Ravens Stadium: A Dozen Years of Betrayal, Anger and Frustration Exorcised With a Shovel". The Baltimore Sun. July 24, 1996. Retrieved March 7, 2012. ↑ Federal Reserve Bank of Minneapolis Community Development Project. "Consumer Price Index (estimate) 1800–". Federal Reserve Bank of Minneapolis. Retrieved October 21, 2016. ↑ "Services". Thesportsroadtrip.com. Retrieved 2014-05-19. ↑ Hensley, Jamison (May 6, 2010). "Ravens Replace Artificial Turf at M&T Bank Stadium". The Baltimore Sun. Retrieved January 15, 2012. ↑ Shpigel, Ben (January 15, 2012). "A Typical Ravens Success: With Grit and Without Fear". The New York Times. Retrieved January 15, 2012. ↑ Burke, Mike (August 8, 2007). "Navy Feels Snubbed By Terps; What Else Is New?". Cumberland Times-News. Retrieved January 17, 2008. ↑ Gardner, Tim (February 27, 2010). "Ravens' M&T Bank Stadium to Host Ohio State-Navy Matchup in 2014". USA Today. Retrieved May 27, 2012. ↑ "Maryland, Penn State to play at M&T Bank Stadium in 2015". ↑ "Turkey Bowl will move to Towson's Johnny Unitas Stadium for one year – Baltimore Sun". Articles.baltimoresun.com. 2011-07-14. Retrieved 2014-05-19. ↑ Van Valkenburg, Kevin (July 25, 2009). "Soccer Invasion". The Baltimore Sun. Retrieved July 25, 2009. ↑ "Hype exceeds the play in Liverpool-Tottenham scoreless draw". Washington Times. 2012-07-28. Retrieved 2014-05-19. ↑ Archived January 26, 2013, at the Wayback Machine. Wikimedia Commons has media related to M&T Bank Stadium. 1 Both the New York Giants (NFC) and the New York Jets (AFC) share the same venue. College football venues in Maryland and Washington, D.C.